(CNN) -- For a moment, the spotlight will be back on Sen. Hillary Clinton as she takes the stage Tuesday for her last solo hurrah of the 2008 presidential election. Sen. Hillary Clinton will deliver a highly anticipated speech Tuesday night. Even though she's not Tuesday's keynote speaker, all the attention will be on her as she steps into a role that's a far cry from her original convention dreams. "Tuesday night is Hillary night," one Democratic source said. The next day, the Democratic senator is expected to release all her delegates to Barack Obama, bringing her White House run to an end. In her speech Tuesday, Clinton will call for her supporters to rally behind Obama, said Doug Hattaway, a Clinton adviser who is part of the team crafting her speech. "I think we are going to hear that theme again -- loudly, clearly and in a heartfelt way," he said. "The promise of America is that all of us will have access to opportunity, and I want to run a 2008 campaign that renews that promise, a campaign built on a lifetime record of results," she said in a statement declaring her intentions. "I'm in. And I'm in to win," she said. At the time of the announcement, Clinton was the hands-down favorite to carry the Democratic nomination. Her supporters thought that exactly two years from that day -- on January 20, 2009 -- she would be the candidate sworn into office. Back then, everyone knew what Clinton wanted: She wanted to run for president, and she wanted to make history with a win. But after a protracted and bitter primary battle, that was not how the story unfolded. Shortly after the primary season began, Clinton lost her grip on the first-place spot. It was Obama, the junior senator from Illinois, who would make history as the first African-American to lead a major party ticket. "On this January night, at this defining moment in history, you have done what the cynics said we couldn't do," Obama told wildly cheering and chanting supporters in Iowa after he won the first contest of the election season. Obama passed Clinton in the pledged delegate count in February. By May, he led across all fronts: pledged delegates, superdelegates and the popular vote. Despite calls to drop out of the race for the sake of party unity, Clinton vowed to stay in until every state weighed in. Clinton squeaked out some wins in the home stretch. In the final months of the Democratic primaries, she won 500,000 more votes than Obama. Even as Obama inched toward the finish line, he was clearly out in front. No longer did people know what Clinton wanted. In Clinton's non-concession speech, given on the night Obama crossed the delegate threshold, she tried to answer that question. "I understand that a lot of people are asking, what does Hillary want? What does she want? 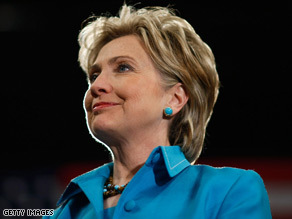 Well, I want what I have always fought for in this whole campaign," she said June 3 in New York. "I want to end the war in Iraq. I want to turn this economy around. I want health care for every American. I want every child to live up to his or her God-given potential, and I want the nearly 18 million Americans who voted for me to be respected, to be heard and no longer to be invisible. "While I traveled our country talking about how I wanted to help you, time and again, you reached out to help me, to grab my hand or grip my arm, to look into my eyes and tell me, don't quit, keep fighting, stay in this race for us." Clinton said that no decisions about her campaign would be made until she met with her supporters and party leaders. Three days later, she suspended her campaign and endorsed Obama. In what is being touted as a bid to heal the wounds of the bitter primary season, Clinton's name will be placed in nomination at the convention. Obama's campaign encouraged her to have her name placed in nomination "as a show of unity and in recognition of the historic race she ran and the fact that she was the first woman to compete in all of our nation's primary contests," according to a statement from both candidates' press offices. Clinton suggested that doing so could provide a "catharsis" for her supporters. Clinton is scheduled to meet with her delegates Wednesday and will probably release them to Obama, sources said. "Don't be fooled into thinking this means it's one big happy family working together in concert. There's still, to my mind, a surprisingly large amount of negative feelings on both sides with these two camps," said Mark Halperin, a political analyst. Voters are not quick to forget the bitter battle that framed the Democratic race, and voters are also not quick to believe that the wounds of the former rivals have completely healed. Clinton is a passionate fighter. Remember when she entered a campaign event in to the tune of the theme song from the "Rocky" movies? During her address to the AFL-CIO in Philadelphia, Pennsylvania, she said it herself: "When it comes to finishing the fight, Rocky and I have a lot in common. I never quit." If Clinton pursued unity with the same gusto that carried her through the campaign season, perhaps people would stop asking, "what does Clinton want?" On Tuesday, Clinton has the opportunity to make clear just what she is fighting for.